Samsung today added one more handset to its expanding portfolio of Android handsets. The freshly announced Samsung I9000 Galaxy S is indeed one of the best Android phones out there. It has some features found in Samsung’s Wave smartphone. The device running a custom UI over Android 2.1 OS, includes a 4 inch AMOLED capacitive touch screen to visualize it at the best. It would be the first Android phone to some out with Bluetooth 3.0 support. Samsung I9000 Galaxy S is very thin in its design. However, this 9.9 mm device packs a 1GHZ processor and 5 MP camera with auto focus and HD video recording. These specifications show that Galaxy S going to the next flagship Android smartphone of Samsung electronics. As we said earlier, the Samsung Galaxy S includes a 4 inch super AMOLED display with 480 x 800 pixels (WVGA) resolution. Viewing movies and web browsing is an absolute pleasure on this high resolution screen. Samsung Galaxy S comes with native playback support for high definition DivX and XviD videos. Moreover, the 5MP camera can record videos at the 720p resolution. The custom designed interface of Samsung I9000 Galaxy S sits over Android OS 2.1. We hope that device might support multi-touch and pinch-to-zoom in browser, galleries and other applications. The home screen of the device can be customized using widgets and applications. Samsung I9000 Galaxy S performs too well on the networking and data connection side. This Bluetooth 3.0 enabled the Android phone support quad-band GSM and high speed 3G networks. 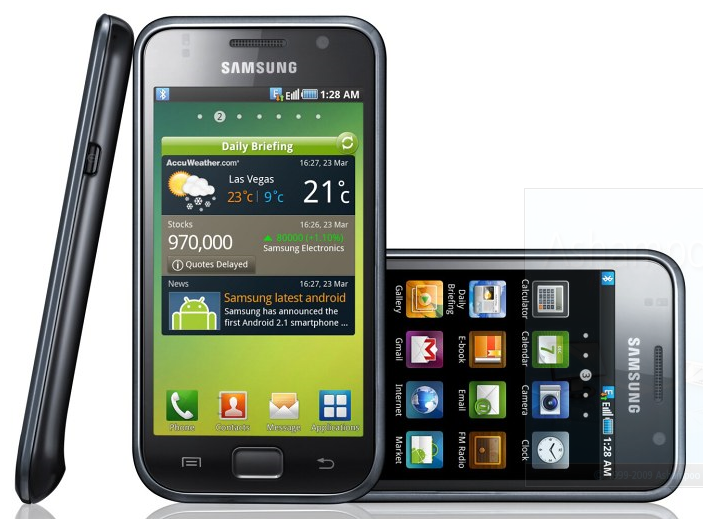 Samsung I9000 Galaxy S packs ARM Cortex A8 1GHz processor, making it the most powerful Android phone in market. It will be available from Q2 of 2010 in selected world markets. Samsung hasn’t announced the price of Galaxy S I9000. However, comparing it Bada based Samsung Wave, we guess that it would cost around 600USD on launch. 820 USD is a lotta lettuce but how much would it be if launched with a carrier like AT&T is my question? (answer not required but food for thought). I heard it going to be called SCH-i897 on AT&T which would be great. Because the Dell Aero and Backflip isn’t close to smartphones and this phone blow everything out of the water. I hope it will be priced around $600.00us when launch on June 1st. $820.00us ($600.00euro) would be too much. It does support multi-touch, would be minus the price tag. Maybe on contract nd then jailbreak?